A few years ago I was diagnosed with ovarian cysts, and one of my best friends recommended this book to me to stop my frantic scrolling through WebMD and other health sites that keep telling me I’m going to die. She read WomanCode while prepping for pregnancy and since the author herself suffered from PCOS, I figured it couldn’t hurt. And honestly it didn’t. But as a person who grew up with a professional salesman for a father, I know when someone’s trying to sell me something instead of just, you know, putting the information out there. 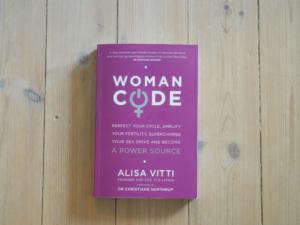 The author, Alisa Vitti, runs a wellness clinic out of Manhattan where she uses dietary and lifestyle changes to help those suffering from PCOS, cysts, infertility, irregular periods, PMS, and low libido. WomanCode is the name of her program along with her (very Oprah-like sounding) practice, FLO-living. I’m sure many, many menstruating individuals have found this to be a helpful and successful program, and I don’t doubt their recoveries, since the more research that comes out, the more we understand how much food and stress effect our bodies. However, this book read like one of those facebook workout ads that claim to have the magical fix for diastasis recti, metabolism imbalance, or any number of ailments that are keeping us all from looking like Kate Moss on the cover of Vogue. At the end of the intro, I kept waiting for the pop-up ads before remembering I wasn’t on facebook, I was reading an actual print-and-bound book. I carried on, however, and in many ways, I’m glad I did. Womancode does cover a ton of useful ground in breaking down the ways in which hormones work to control the different body systems, and how to read outward symptoms to be able to tell what the hormones are doing, and when they’re out of whack. There are helpful charts to show how certain foods effect hormones and explanations of why the body reacts in certain ways during specific times of a menstrual cycle. I also applauded Vitti’s chapters on sexuality and the importance of self-care and self-pleasure. It’s still not a subject talked about very openly, and she does so honestly and helpfully. Her science is sound, and I have to say, the period-tracker app from FLO-living is super comprehensive and I really like using it. I did learn things by reading this book, and when Vitti’s in her science/prescription voice, her book is interesting, educational, and easy to follow. She’s also extremely open and accepting of all options. She doesn’t beat people up about hormonal birth control, she doesn’t judge or swear off anything (except popular cleaning products. She’s really against bleach…. ), it’s all really about moderation, which I was happy to see. But the book could have been about 200 pages shorter if all the “Have I mentioned my practice, FLO-living?” asides and “testimonials from real clients” sections had been removed. I have no problems with someone plugging their business or using their research book as a follow-up to their business, but as a close-reader, I can see manipulative language from a mile away, and the consistency with which Vitti kept plugging her brand made me far more suspicious of her research than if she had just written a self-help book about dealing with menstrual wellness. Share the post "I Wish This Hadn’t Felt Like I Was Being Sold Snake Oil"
Did We Really Need that Character? Thank you for your frank observation here! I had been curious about this book- and system- but had seen too many commercial-testimonial-esque reviews.